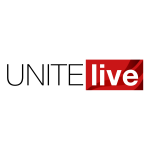 The first strikes in a UK casual dining chain in decades have moved a step closer today (April 11), after Unite notified TGI Fridays that it will be balloting workers in two branches for strike action, in what will be the first in a series of strike ballots over the coming months. Waiting staff at the American dining chain’s Milton Keynes and Covent Garden restaurants are being balloted from Wednesday, April 18 over breaches of the company’s tip and tronc policy and minimum wage abuses. The ballots close on Tuesday, May 1. 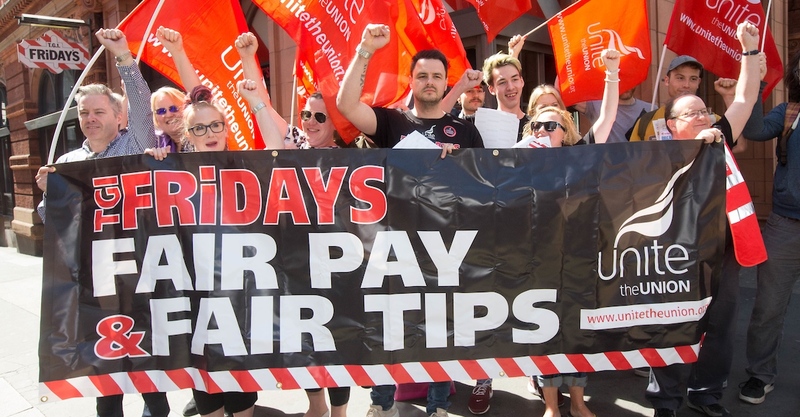 TGI Fridays which has 83 branches across the UK is now facing a wave of rolling strike ballots as the union prepares to ballot workers in two restaurants a week from Friday (April 13). 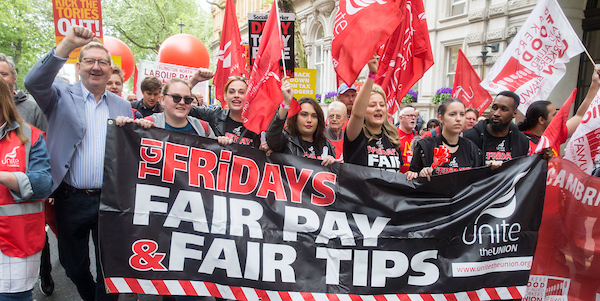 A protest will be held outside the chain’s Covent Garden branch this Friday (April 13) from 6.30pm to mark the launch of the first ever strike ballots to hit TGI Fridays since opening its first UK restaurant in Birmingham in 1986. “Our members are bravely fighting back against a system that forces workers to live on low pay and without income security,” said Unite regional officer Dave Turnbull. “The ballot of TGI Fridays workers comes just days after workers at fast food giant McDonalds decided to ballot for further industrial action at six stores, building on their historic strike last September,” he added.